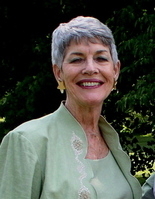 Nancy Wheelwright Leigh left this world on January 14, 2015. She lived with her husband, Douglas, in Huntington, CT since 1996. Previously, they resided in Weston, CT for 42 years. In addition to her husband, she is survived by daughter, Berry, son Doug III and grandson, Matthew Reinheimer. Nancy grew up in Riverside, CT. She was a graduate of Linden Hall Preparatory School for Girls, Lititz, PA. Later, she attended Parsons School Of Design, NYC, then began a modeling career with The Institute of Modeling. She eventually joined the fashion department of Bergdorf Goodman, NYC. Throughout her adult life, she was an active member of her church affiliation. She joined Norfield Congregational Church after moving to Weston with her husband. She worked on several committees and served a term as a deacon. Her talent for writing spiritual insights, sensitive wisdoms and musings is evident in 3 self-published booklets. One, entitled "God In The Kitchen," reveals her ability to recognize the relationship between the beauty of naturally grown foods and God's hands at work. A memorial service will be held at Norfield Congregational Church, Weston, CT on Sat. January 31, 2015 At 1100 AM, followed by a reception in the church community room. In lieu of flowers, a donation to Bridgeport Rescue Mission is suggested. Nancy will be remembered for her gracious warmth which she eagerly displayed as a hostess at home and for everyone who knew her.